Will China’s New Policy Silence Future Protesters? Mass protests in China have quadrupled over the last decade. A new environmental regulation could make it easier for authorities to suppress protesters before they hit the streets. China’s leaders made it clear this week that they want to put an end to the growing number of environmental protests flaring up across the country. On Monday, environment minister Zhou Shengxian announced that future industrial projects must include a “social-risk assessment” before they can launch, a plan Zhou hopes will reduce “the number of emergencies and mass incidents.” In other words, if you’re a local official who has plans to build a new power plant in your town, you’ll first have to predict how much it will piss off your citizens. Many China observers see Zhou’s statement as a reaction to the increasingly large, frequent, and violent environmental protests staged by citizens ranging from upset farmers in rural villages to students and middle-class residents in major cities. Most recently, citizens in the coastal city Ningbo reportedly gathered by the thousands over three days to protest the expansion of a petrochemical plant that produces paraxylene, a toxic ingredient used to make polyester (PDF). The plant is owned by Sinopec, one of China’s biggest oil and gas companies and the largest petroleum refiner in Asia. The Washington Post reported that some people grew violent after authorities opened tear gas and arrested protesters. Ningbo is hardly the first to see such protests; citizens in Xiamen, Dalian, and Shifang have staged similar demonstrations in recent years. These protests, which the Chinese government calls “mass incidents,” show few signs of abating; in 2010 they numbered around 180,000 by one scholar’s estimate—four times the figure a decade earlier. Yang Zhaofei of the China Society of Environmental Sciences told the state-owned paper China Daily that public protests over the environment have been swelling by 29 percent annually. A protest in Wukan, Guangdong, late last year earned particular notoriety when some 4,000 villagers took to the streets to demonstrate against illegal land seizures and rigged local elections. The protests escalated after authorities allegedly tried to cover up the death of a demonstration organizer who was beaten by police. 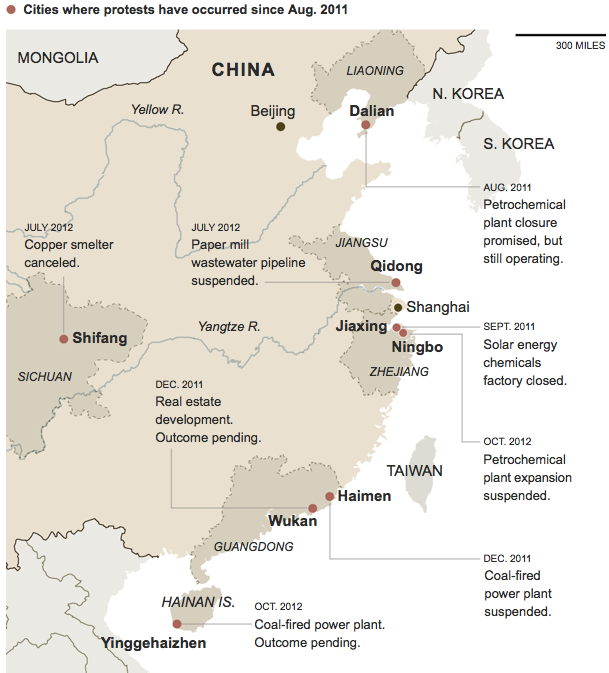 This map by the New York Times highlights some of China’s most notable environmental protests over the last year. In part, Zhou’s remarks are an expression of the frustration among many environmental officials whose opinions are often outweighed by those investors and politicians with stakes in industrial projects, says Ma Jun, one of China’s foremost environmental advocates who runs the pollution monitoring group Institute of Public and Environmental Affairs. “The environmental agencies feel they have been put under too much pressure, beyond the authority they’ve got,” Ma told the New York Times. “Mass incidents” in China number around 180,000—four times the figure a decade earlier. Although Zhou’s plan might demonstrate political will from the Communist Party leadership to make decision-making around industrial projects more transparent, it’s doubtful the plan will do much to heed the demands of protesters, some China observers say. On the up side, Qian Jingjing, the China program director at the Natural Resources Defense Council, says that requiring social-risk assessments is “a step in the right direction.” She explained that since August China’s National Development and Reform Commission—main economic planning agency which oversees industrial projects—started requiring social-risk assessments before approving certain projects. Qian concedes that it’s unclear how effectively social-risk assessments will respond to the views of local citizens, and that they’ll need to include measures such as public notices, public hearings, site visits, and questionnaires to assess public opinion toward a project. Another open question is whether the new social-risk assessment requirement will successfully reduce the number of protests in the absence of fundamental reforms to the legal system and political freedom. Whether what they seek is damage compensation, the relocation of a power plant, or the removal of a corrupt official, public protests in China often take place after citizens have tried—and failed—to seek justice through petitioning or by going to court. *Full disclosure: Between 2007 and 2010, I worked for Elizabeth Economy as a research associate at the Council on Foreign Relations. How is Fox News Like the Communist Party?